What a fantastic year we have had, what with the rule changes and some great weather and yet another young champion to celebrate. It was a thrilling closely competed championship, with three potential champions at the last event of the season. 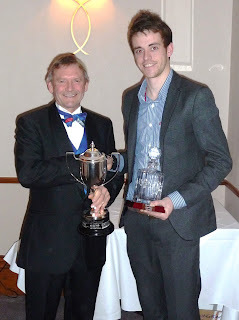 As usual the 2011 season was wrapped up with a presentation dinner at Wroxton Hall Hotel near Banbury. The drivers meeting started the proceedings at 3pm, presided over by our co-ordinator Roger McEwen, during which we reviewed the past season, elected officers and voted on any changes to the championship rules. The main piece of business this year was a change to the scoring system. At last years drivers meeting we agreed a change to alter the complete ethos of the championship by allowing not only any Triumph to compete but also any standard of car without the encumbrance of a strict class system. We all agreed this had worked fine and once established we hope will encourage more competitors to our ranks. Whilst in principle the new system has worked well, there was one change needed with the scoring system to limit improvement over bogey time, this being necessary as competitors who completely trashed their bogey, whilst doing well themselves, had an unnecessarily large adverse effect on the results of fellow competitors at that event. Limiting score to 2.5% above bogey we hope will cure this. Apart from that, we discussed ways to promote the Championship more (including this blog!) which has been ably persued through 2011 by Kevin Bryant. Unfortunately Kevin couldn't be present as his clutch died on his TR3 on the way to the meeting, but thankfully it only appears to be slave cylinder rubbers that are at fault. 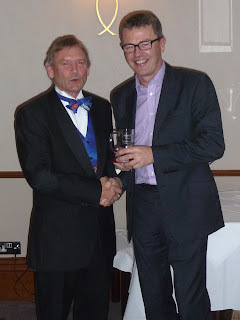 As usual earnest thanks were given to Roger McEwen for his continued commitment to organising our championship, after which we adjourned to the bar. 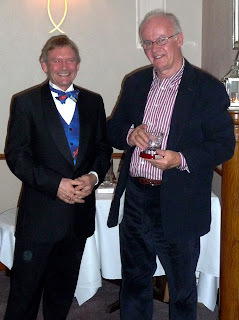 For most the highlight of the evening was of course our presentation dinner, Sue and I agreed that the meal this year was second to none. We took a break between starter and main course to present the awards. Jonathon Weedon was our champion this year, driving his dads car, which is a beautifully prepared red TR5 in race trim and unusually sporting a live rear axle. Jonathon has really now settled into the car and driving it superbly well, he did this to some considerable effect, given that he achieved maximum points at every event he took part in: well done Jonathon! David Hardcastle and Simon Allaby sharing an extremely rapid TR7 V8 came second and third respectively. 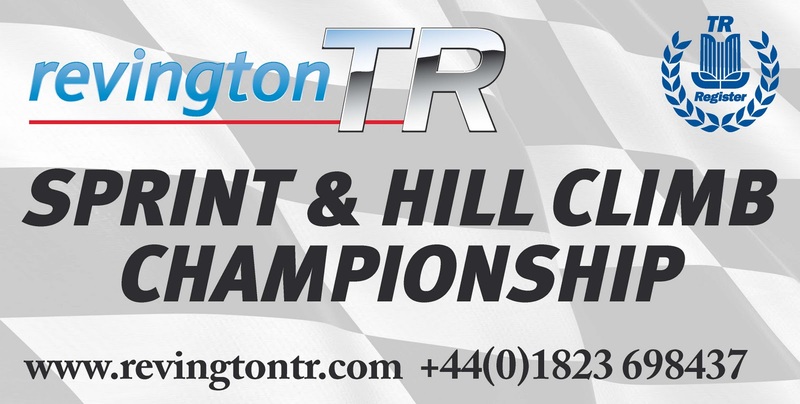 We were hoping that the championship would be down to the wire at Castle Combe which was the last event of the season. Jonathon turned up as did Simon and David who all had a chance of becoming champion. Unfortunately the TR7 V8 developed symptoms of the flywheel falling off the engine. I suggested we could get the gearbox out, see if we could tighten it all back up again and get it re-assembled for afternoon runs but the lads felt this was too daunting and the car went back on the trailer. This was a shame as we had looked forward to a good ol' ding dong to sort out the champion at the end of the year. None-the-less Jonathon was a worthy champion. Simon could not attend the dinner, so David received the award for him. 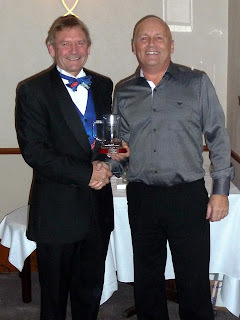 Nick Smith took the award for best newcomer, who managed to attend more meetings than any this year and given that this was his first season he quite clearly was enjoying himself. Nick proved to be quicker than our handicappers had anticipated and some quick re-calculations of his bogey times were required. Nick drives a TR6, which is relatively standard, but he still pedals it pretty sharpish. At this rate Nick is a strong contender for a championship win in 2012. Here I must point out, the photographs were taken by Rod (except the one of himself, see below) and I know he took several of me presenting Nick with his award but he chose to send me for this blog when we were joking about something and I decided to throw a pout: we don't take it too seriously, it's all for fun after all! The final three awards were for best performance by cylinder capacity. Historically these would have been class awards, but of course we don't have classes any more. 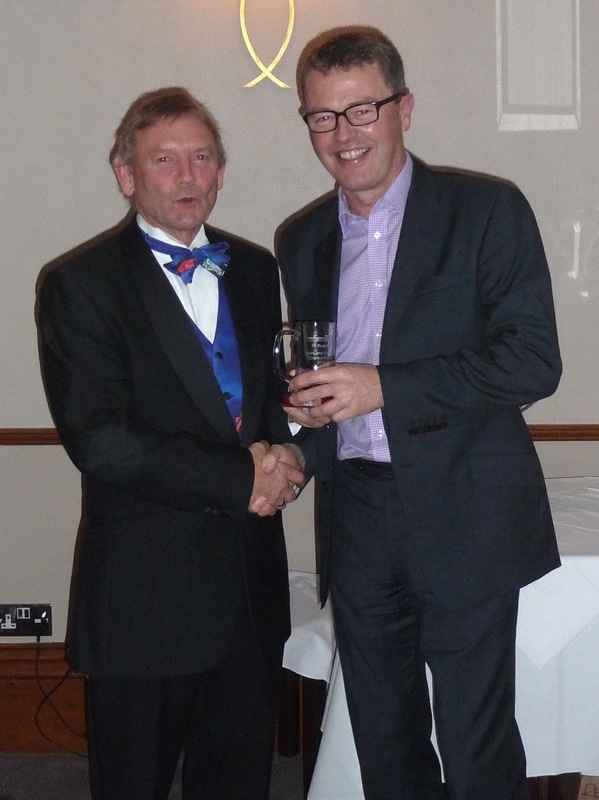 Graham Ramsey took the 4-cylinder trophy driving his near standard yellow TR7. 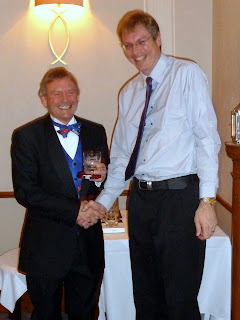 At presentation dinners, when Graham wins an award we always skew the photograph by me bending my knees slightly as Graham is so tall we always look like 'Little and Large'. 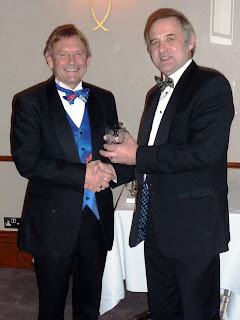 John Weedon took the best 6-cylinder award in of course the same car that Jonathon won the championship. There have been several father son partnerships in the past and inevitably there is a high chance that son will do better than father in the long term. Could this be an age thing? Or a wallet thing I wonder! The 8-cylinder award was received by Rod Warner. His black TR7 V8 has been around for eons, always performs reliably and seems to have a few tweaks every year to make it go a bit quicker. 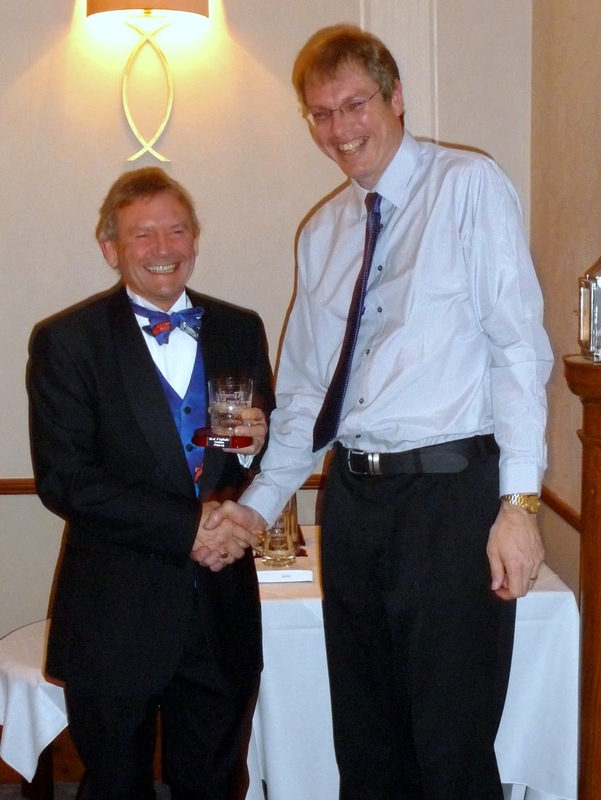 Rod contributes hugely to our championship as he is the one who crunches all the figures for us. Congratulations to everyone who won an award this year and thank you to everyone who competed as for there to be winners their needs to be a full grid of competitors to make it all worthwhile. John and Jonathon are taking part in a different championship next year, they've certainly as a family supported the championship over a considerable number of years. When John was first competing in his TR4, Jonathon was being pushed around the paddock in a push chair. Jonathon is now pushing his first child around the paddock in a push chair, so it would be fair to say that they have been lifelong supporters. So thanks to all the family for your support over the years. Looking forward, we already have a provisional calendar for 2012, with some new and interesting venues to attend. If you are contemplating having a go, please come and join us, you really can 'run what you brung', as long as you have the clobber (helmet, overalls, licence etc.) and conform to a few simple safety rules. Any of us will be delighted to assist, myself, Roger or any other of the competitors, I feel sure we will all be happy to give the benefit of our experience. The full list of 2012 events will be available to see at any time on the competition section of the TR Register website. We will keep you informed, via our website and blog throughout the year and if your into this new fangled book face thing, we have a page here and a twitter feed here. For my part, many of you remember I started building a TR3 Beta for the purpose of competition in the middle 80s but rule changes at the time meant that this lightweight special had nowhere to play. It's a TR4 chassis with a TR3 Beta body and a TR6 fuel injected engine. For years when we had first bought Thorngrove Barns, it laid in an open lean-to decidedly unloved. 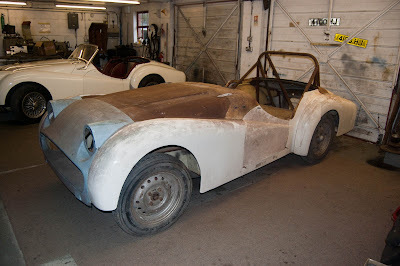 However we dragged out SKOLLOB (as it is affectionately known) and brought it into our workshop, where I hope to get it ready for sometime next season. I'd be astonished if it is ready for the beginning of the season but it may come out during the later part of the year. Even though after so many years, exposed to the elements, it is still surprisingly sound. The inner shell, which is steel, has lots of surface corrosion and the fibreglass outer panels have a few knocks, which will hopefully be easily repaired. Marcus insisted on taking a photograph of it, despite it looking bloody awful but I take his point that rags to prince is always a nice story. Talking of my son Marcus, who of course writes these blogs not me (hi! ), or at least runs the keyboard, while I pontificate, he and his sister Natalie have been hankering after having a go in competition for some time. So they are getting competition licences for Christmas and will be seeing them double driving with me or one another during 2012. We are all looking forward to a great season in 2012, if you are not planning on competing, it certainly would be great to see you at one of the events as a spectator as it makes our day more enjoyable having like minded people to chat to. Best regards and see you in the new year!